The accident illustrates the challenges faced by first responders unfamiliar with the special characteristics—and hazards—of electric vehicles’ powertrains. Safety experts say the only way to extinguish a lithium-ion battery inside a car is with thousands of gallons of water, much more than what it takes to stop a fire in a typical gasoline engine. The other option is to just let it burn itself out. “It’s such a difficult fire because it takes so much water to put out,” said Robert Taylor, fire marshal in Davie, Fla., where the crash occurred. What First Responders Don’t Know About Fiery Electric Vehicles And Lithium Batteries That Old Tech Can Not Handle. USA Fire Fighters Need All New Safer, Cleaner Fire Technologies For Today’s Car Fires, Wild Fires And Large Scale Wood Framed Arson Attack’s During Construction. All New Fire Tech Is Readily Available If Someone Steps In On Old Relationships In The Club. M-Fires Clean Fire Techs will win in human safety and fire elimination testing better then every chemistry being used today by Fire Fighters. The government needs to step in to defend there loss and call a Fire Elimination Summit to determine what is best. The police may not have known lithium-ion batteries inside electric vehicles, once ignited, can’t be put out with chemicals from a conventional extinguisher. The battery fires are susceptible to a self-destructive chain reaction known as thermal runaway, causing a feedback loop of rising temperatures. 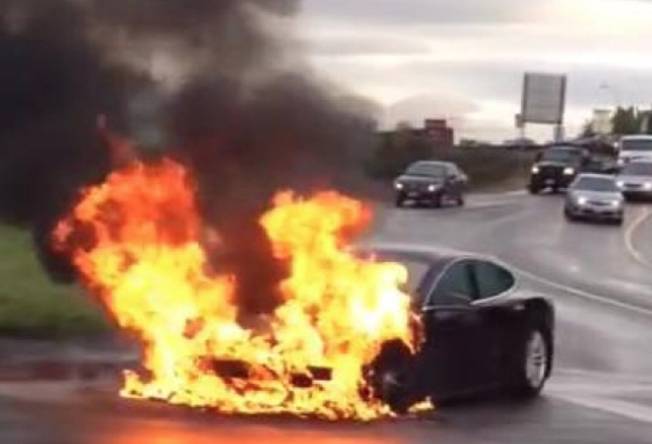 The Tesla fire stumped a series of first responders in Florida. Firefighters eventually doused the flames with water, which seemed to work, but the wrecked car reignited twice more after being towed away. That prompted what a police report later termed “extraordinary measures,” including a call to Broward County’s hazmat unit for advice on stamping out the fire once and for all.